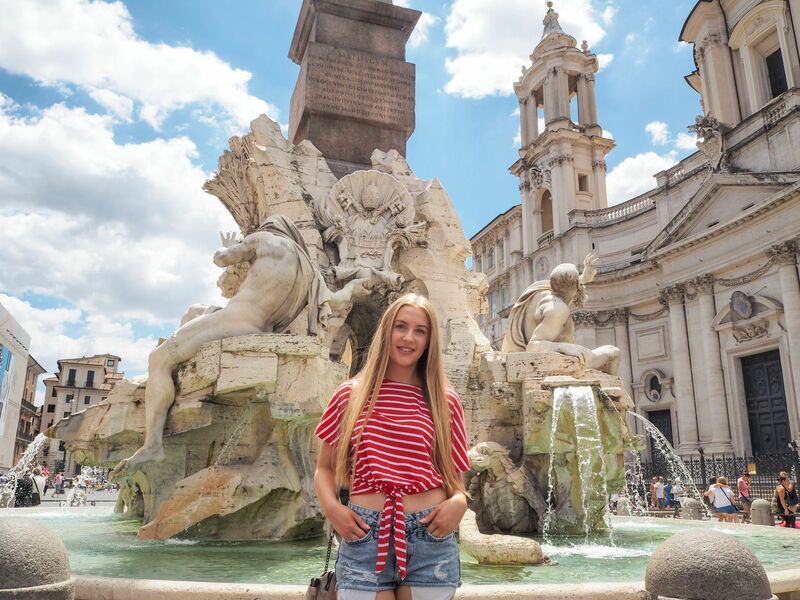 Rome is an incredible city, bursting with so much history, beautiful architecture, and delicious food, it truly makes for the perfect trip, no matter how long you spend there. At the end of June / beginning of July, myself and my boyfriend spent a glorious 7 days in the Eternal City, and even though it was our first time in Rome, we managed to see pretty much everything that we wanted to – it helped by planning ahead! 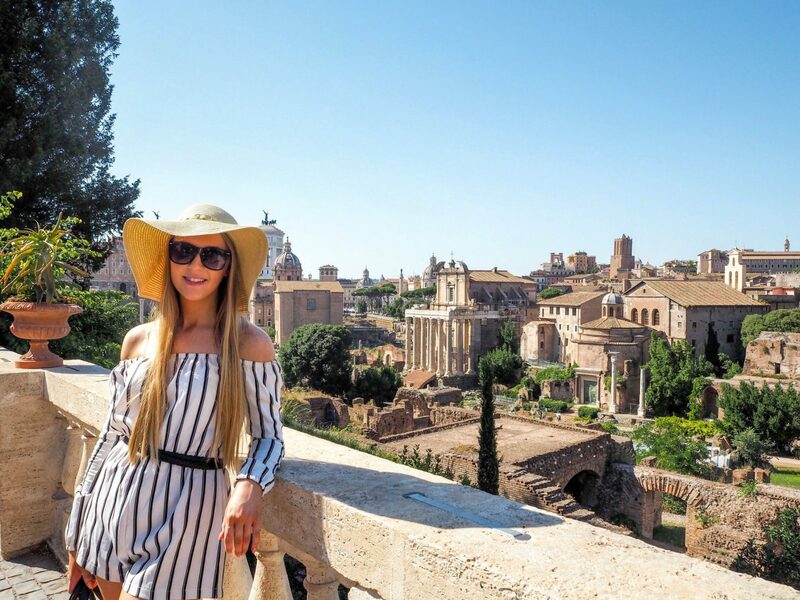 Although I’ve already written about what I wore whilst I was in Rome, and the perfect 7 day itinerary (if you need help planning your trip), I wanted to put together this final post from the trip that connects everything together, along with my tips and tricks, in the Ultimate Rome Travel Guide. We booked our flights 2 months before our trip, which cost around £160 each (return) with British Airways, including our hand luggage and a checked bag each. The price of the flights actually went up (almost double!) from when we first looked at it a few weeks before, so if you see them for a good price, I’d recommend just booking them. We booked our flights directly with BA as I had a voucher to use, then we booked the hotel separately, as it worked out cheaper than a package for the hotel that we wanted. We flew out from Gatwick, and back into Heathrow, which didn’t really make much of a difference for us as we had a lift to and from the airport, so we didn’t need to worry about airport parking. There are 2 airports in Rome: Ciampino (which is the smaller of the two), and Fiumicino (also known as ‘Leonardo da Vinci International Airport’), which is where we flew into, with the flight taking around 2 and a half hours. We departed London at 8:20am and landed around 11:55am (local time), then left Rome at 20:20pm coming home, landing back into London at 21:55pm (again, local time), to allow us to make the most of the time we had there. I like being prepared, so I’d actually looked up our transfer options before we arrived, and a train (Leonardo Express) worked out as the cheapest and easiest way to get to our hotel. It cost €14 each for a single ticket, which was for the fast train, and it took approximately 30 minutes to get to Roma Termini – which is the main train station in Rome. It was also a direct train, which was great as we didn’t have to wait around at different stops along the way. We used the ticket machine at the airport to buy our train tickets, which was fairly simple to use (we were able to read the info in English, thankfully! ), and you could choose between a 1st or 2nd train – 1st being direct, quicker and more expensive, but you can buy a 2nd train ticket, which takes about 20 minutes longer, but it’s slightly cheaper. 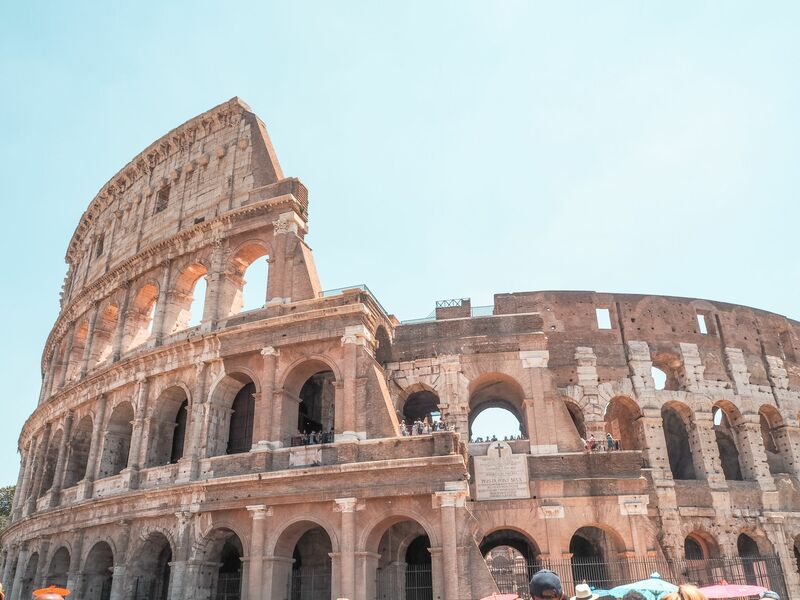 After an early start, we just wanted to get to our hotel and start exploring Rome, so we opted for the quicker train, but if you’re on a budget or wanting to keep the cost down, it’s great there’s an alternative option to choose from. Once we arrived at Termini, I used my phone to get the directions to our hotel, and we were actually only a 3 minute walk away, which was ideal! The hotel was close enough to be able to walk to from the station, but not too close that it was loud and busy. The location was perfect. 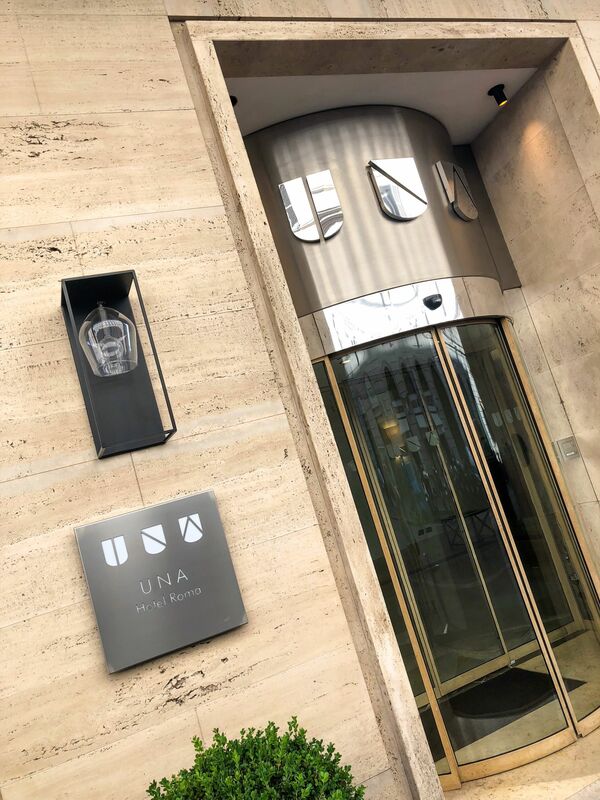 As this was our ‘main’ holiday together this year, we decided to spend a bit more on the hotel, and we stayed at the beautiful UNA Hotel Decò Roma. They had a discount code on their website when we booked, saving us 15% – every little helps! Like I said, we spent a bit more on the hotel (it was SO worth it! ), and it worked out around just under £400 each for 6 nights, which also included breakfast. It was worth the money for the breakfast alone. I may be a fussy eater, but I still love my food. The buffet breakfast was great, because you could help yourself to a wide choice of food and hot and cold drinks. You could choose from hot food, like: sausages, egg, bacon, beans, toast (with the biggest selection of flavours of jam you could think of), or you could go for a box of cereal, yoghurt, fruit, and the best bit… CAKE. Yes, actual cake for breakfast. What a dream. We certainly made the most of the breakfast to keep us going throughout the day – we only really needed snacks throughout the day, and then our main meal in the evening. The room was spacious with a huge comfortable bed, TV, mini fridge, a safe, and a really lovely bathroom. 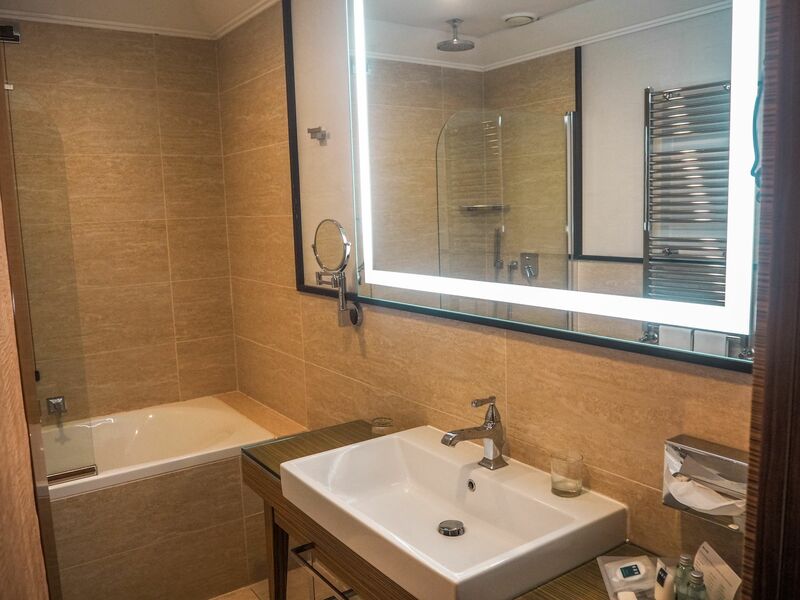 They even have a speaker (which is connected to whatever the TV is playing) in the ceiling in the bathroom, which was a bit of a shock when I suddenly heard someone talking in the bathroom when I was brushing my teeth! The room was super clean, and other than the air conditioning being a little bit too cold sometimes, we had no complaints. This hotel was in the perfect location for us, as it’s pretty central to most places, and we were able to walk to pretty much everything that we wanted to visit, meaning that we could keep the cost down with transport around the city. One of the best things about Rome is being able to walk to each attraction, and ending up finding something spectacular along the way, like we did with finding Piazza Venezia on our way to the Pantheon. I actually made a note of how long it took us to walk from our hotel to each place we wanted to visit: Colosseum = 15 mins, Trevi Fountain = 20 mins, Spanish Steps = 23 mins, Pantheon = 27 mins, and Piazza Navona = 32 mins. We did also walk to Trastevere on one of the days, which took around 40 mins from the hotel, and we went back in the evening in a taxi, which took 15 mins instead. Other than Trastevere, the only place that was a bit too far to walk to was the Vatican City, where we took the Metro. As I mentioned before, our hotel was in the best location for us to be able to walk almost everywhere. 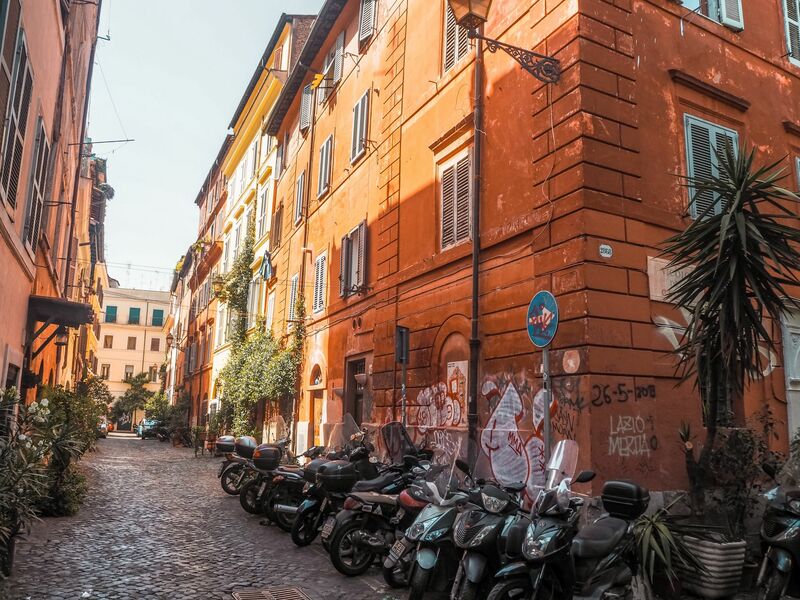 I also think that the best way to see Rome is on foot, as there are so many gorgeous streets and places you’ll unintentionally come across that’ll really add to your experience. I would highly recommend comfortable shoes to walk in (I wore trainers most of the time), as we walked around 20,000 steps a day (one day we did 26,000! ), so comfortable shoes are essential. Many of the streets in Rome are cobbled and uneven, so packing for comfort would be a great tip. We were there for 7 days, so walking to almost every place we wanted to visit wasn’t an issue, as we weren’t rushed for time, but if you only have a couple of days, I’d maybe look into using public transport to save you some time. Other than walking, we also took the Metro (from Termini) on Line A, to Ottaviano – San Pietro, to get to the Vatican City. This took around 15 mins, and it’s a really easy way to get to St. Peter’s Square and St. Peter’s Basilica. This was the only time we needed to use the Metro, but it was fairly easy to navigate – just be aware of pickpockets! We bought a standard ticket for the Metro, which was €1.50 each, each way (we bought the return at the same time), but we actually forgot we’d bought a return ticket, and ended up walking back, via the Pantheon! Another way to get around Rome is by taxi. We only did this for two journeys (as it’s not the cheapest) – from our hotel to a restaurant in Trastevere, and back again. We weren’t feeling another 40 min walk each way again that day! It cost us around €12 each way for the 15 min journey, but after all the walking we’d done up to that point, it was money well spent in my eyes. We also went on an open top bus tour on our last day, which is another interesting way to explore the city. There are a few different bus companies to choose from, but we booked with City Sightseeing Rome, as they were recommended by our hotel, and they had the best route for where we wanted to go. The tickets we bought were valid for 1 day, and they were €23 each. There are other ticket types / prices you can buy, so you can pick one that suits your needs. You can also hop on and off at any of the stops, so if there’s a particular attraction you want to see, it’s easy to get on and off along the route, which makes for a fairly quick and easy way to see the Eternal City. 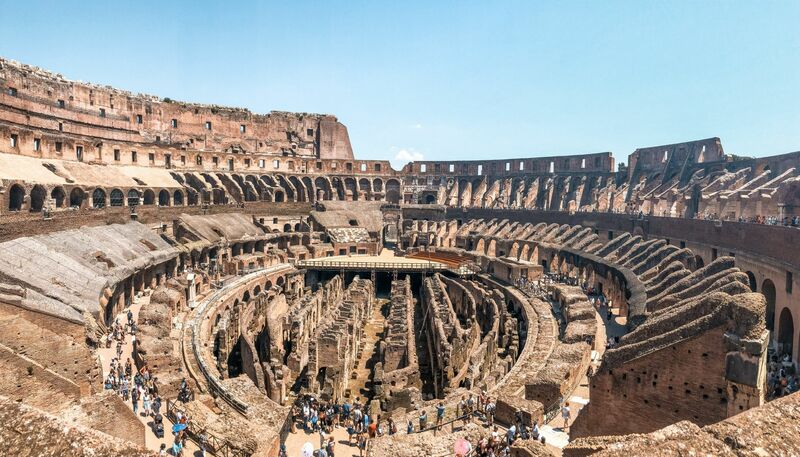 Top Tip: It is free to visit the Colosseum, Roman Forum and Palatine Hill on the first Sunday of every month. Whilst this is great and could save you some money (if you happen to be there around this time), naturally it means that it can be a lot busier, so it’s worth getting there early to avoid too many queues. It goes without saying that the Colosseum was high on my list of places to visit whilst in Rome, and it was absolutely spectacular. I would say it was probably one of my favourite parts of the trip! We didn’t know that it was free to visit on the first Sunday of the month (at that point), so when we got there around midday, the queues were huge! We were told by one of the people selling guided tours outside that the queue would take around two hours before we would even get inside. It’s hard to know when these people are telling the truth or just trying to make a sale, but being there in the middle of summer in the baking heat meant that we decided to just book a guided tour instead, and skip the queues. As it was a ‘free day’, the tours were reduced in price from €40 to €20 each, which included a guided tour of the Colosseum, Roman Forum and Palatine Hill, and we also skipped the queue and were inside the Colosseum within about 10/15 minutes (including the security checks), which was totally worth it with how busy and hot it was – plus, we didn’t have to stand outside in the heat for the 2 hours that we would’ve spent queuing to get in for free. In my opinion, it was worth paying for the tour and skipping the queue, especially as it was cheaper on this day. We booked our tickets on the day, but as the queues can be quite long, you could always pre-book your tickets beforehand and gain entry quicker. The tour of the Colosseum took 90 minutes, and our guide was friendly and knowledgable – he also spoke English (which was a bonus). We learnt about the history along the way, in our small groups, and there were lots of chances to take photos. Once the tour had finished, we had some free time to spend exploring the Colosseum by ourselves, with the next part of the tour (of the Roman Forum / Palatine Hill) starting 90 minutes after. 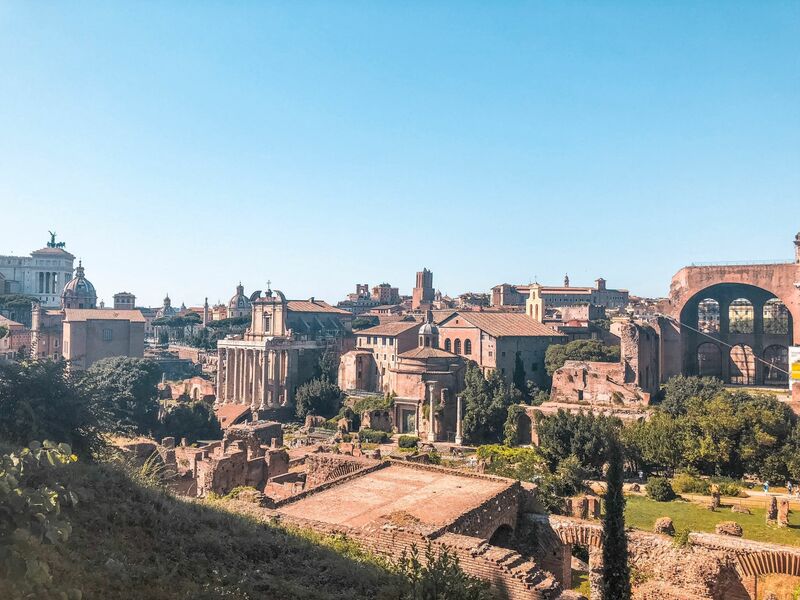 I’ll be honest, we probably wouldn’t have spent as much time as we did at the Roman Forum / Palatine Hill, as we were mainly interested in the Colosseum, but with the guided tour included in the ticket, it made sense to visit. 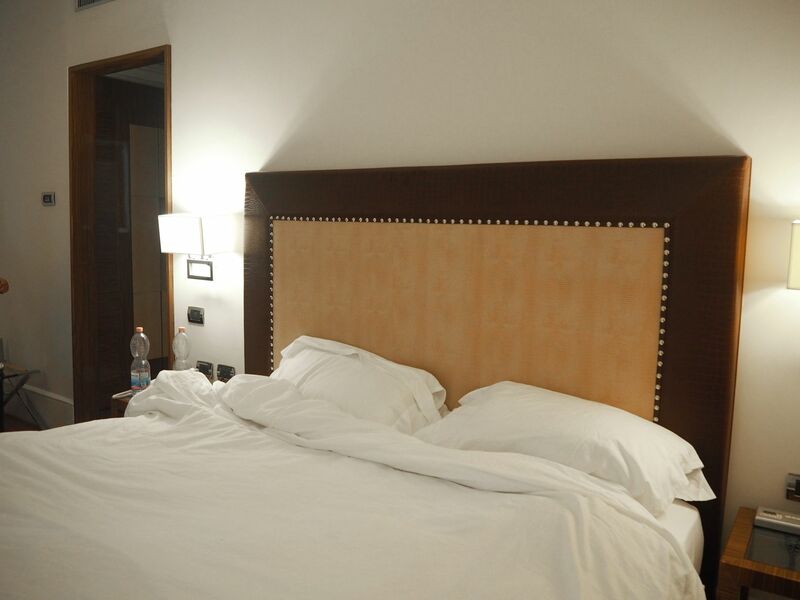 It’s just a short walk from the Colosseum, so make sure you save some time for that. I’m really glad we did go and explore this area, as it was great to learn about the history and see Rome from a different perspective. We had a different guide for this part of the tour, and he was really funny, which made it that much more interesting. After the tour, we were given more free time to have a wander round, which gives you complete flexibility to explore at your own pace. 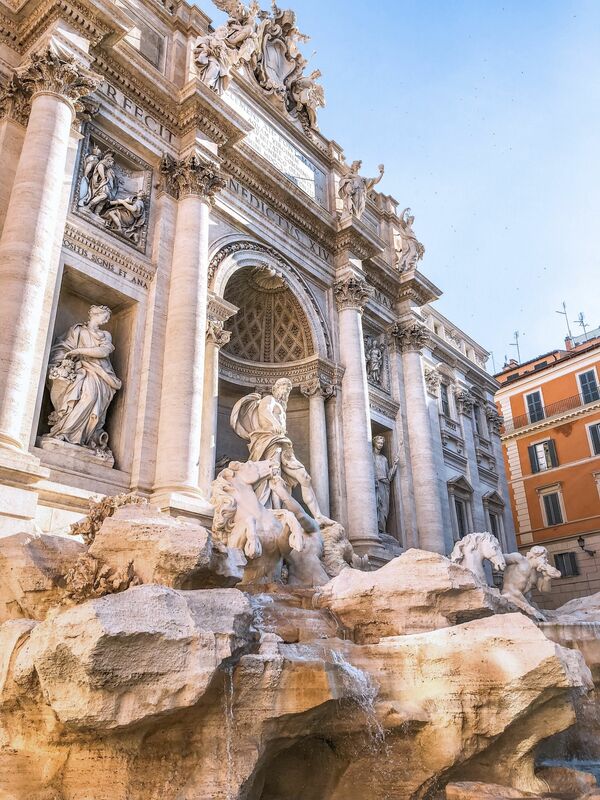 Top Tip: If you want to experience the Trevi Fountain without too many people around, the best time of day to visit would be early morning – by early, I mean 7:30am (which is when I got there on our first morning)! It gets really busy from around 9am, and remains busy until late in the evening. We walked past at midnight on one of the evenings, and it was still packed with tourists, so the best way to get around this would be to go early morning. The Trevi Fountain is really impressive to see, but it was definitely one of the busiest attractions in Rome. 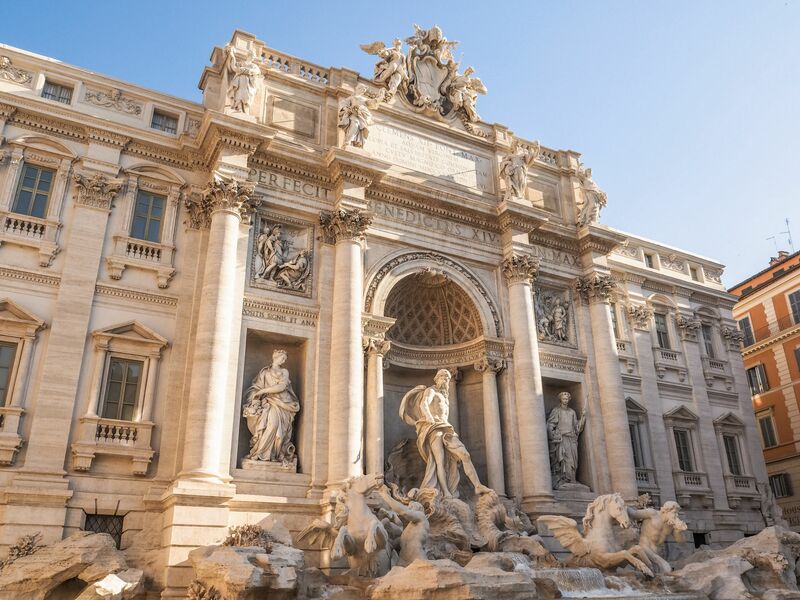 The area where the Trevi Fountain is located is quite small, so when it’s packed full of tourists, it can be a bit overwhelming, but I would definitely recommend taking a trip here. The architecture and overall design of the fountain is absolutely stunning, and it lights up at night, allowing you to experience in a different way. It’s simply stunning however you see it. 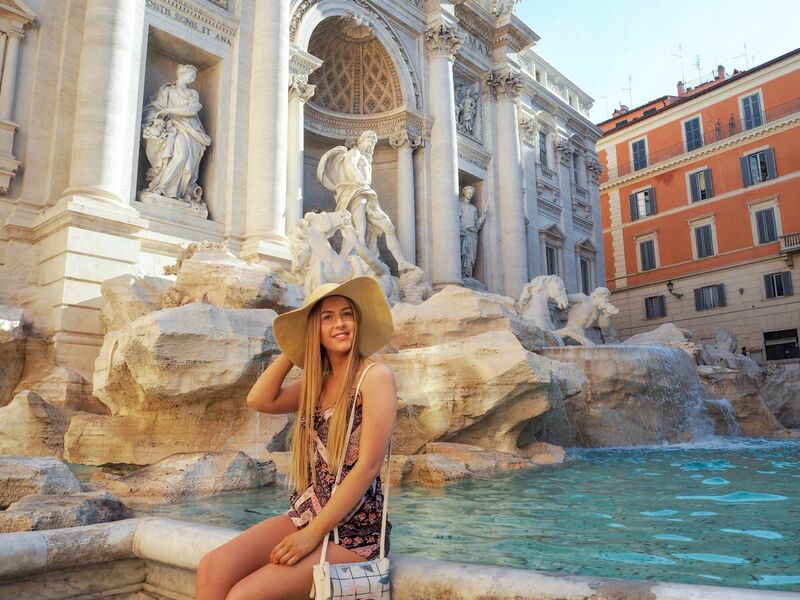 Also, legend has it that if you throw a coin (with your right hand over your left shoulder) into the fountain, you will return to the Eternal City one day, so if that’s not a reason to visit, I don’t know what is. 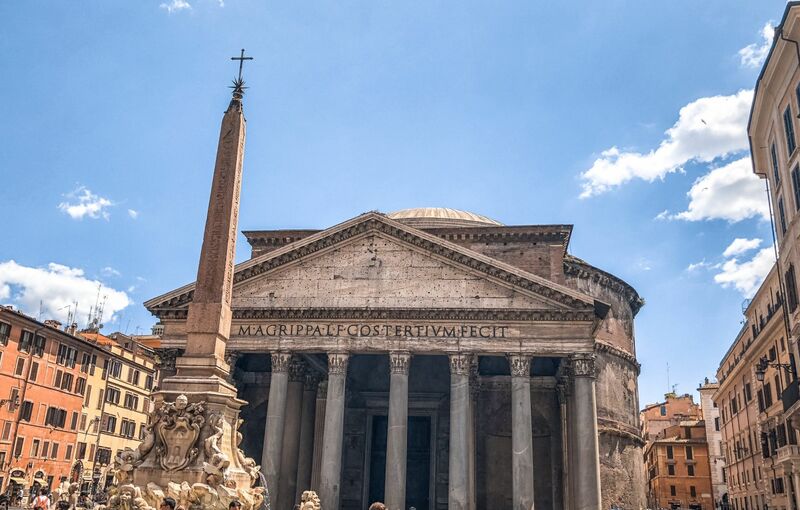 Top Tip: It is free to visit the Pantheon, which is great if you want to experience Rome on a budget. Be aware that because it’s free, the queues can often be quite long. 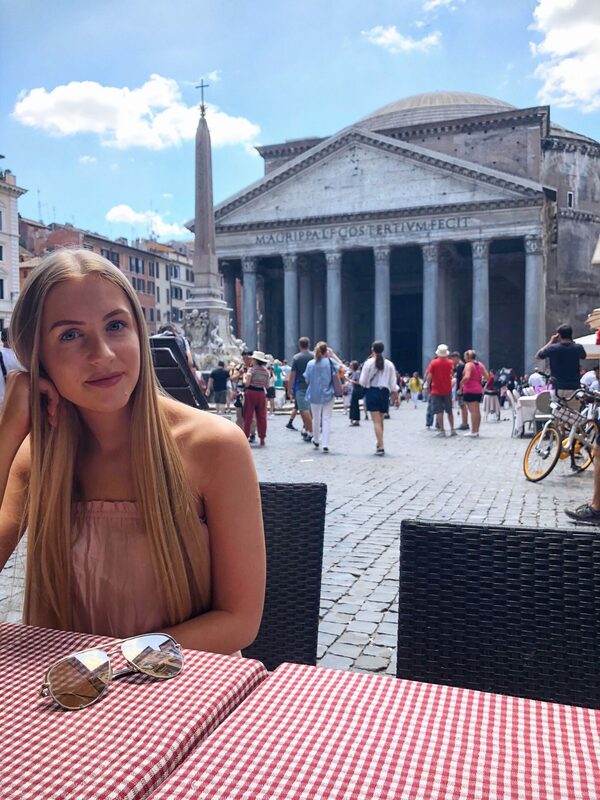 There are lots of little cafés and bars around the Pantheon where you could always stop for something to eat or drink whilst waiting for the queues to go down. 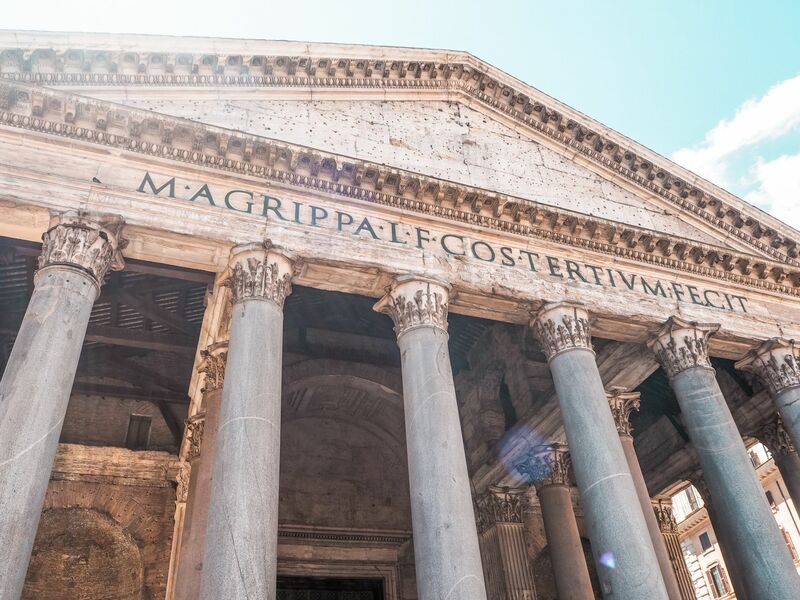 The Pantheon is one of the best preserved monuments of Ancient Rome, and the architecture is unbelievable. With its free entry inside, it’s definitely worth having a look. When we were there, there were a couple of male security guards outside looking at what people were wearing before entering. They didn’t let me in the first time we tried, as I was in a denim skirt, but they weren’t very consistent as there were loads of women that got through in shorter skirts / shorts / dresses than my skirt – I wasn’t aware of any dress code beforehand, like I was with the Vatican Museums. They will try to get you to buy a cover up to enter, but I wouldn’t recommend that unless you are desperate to go in and you’re limited to time. The Pantheon is absolutely incredible, both from the inside and out. There’s an open window (called the ‘oculus’) at the top of the dome, which is really cool to see, as it was the only source of direct light inside. We stopped and had a drink at Napoletano’s before we went inside the Pantheon (to let the queue go down), and we sat on a table outside with the most incredible view of the Pantheon just opposite. (The photo above was taken from this restaurant.) I would really recommend going here if you’re in the area, for the views alone! We didn’t eat there, so I can’t comment on the food, but it was great to have a drink outside with a view of the Pantheon. Top Tip: Book your tickets to the Vatican Museums online in advance through the official website, as it gets really busy, and the queues on the day can sometimes take hours! Also, be aware of the dress code before visiting the Museums. 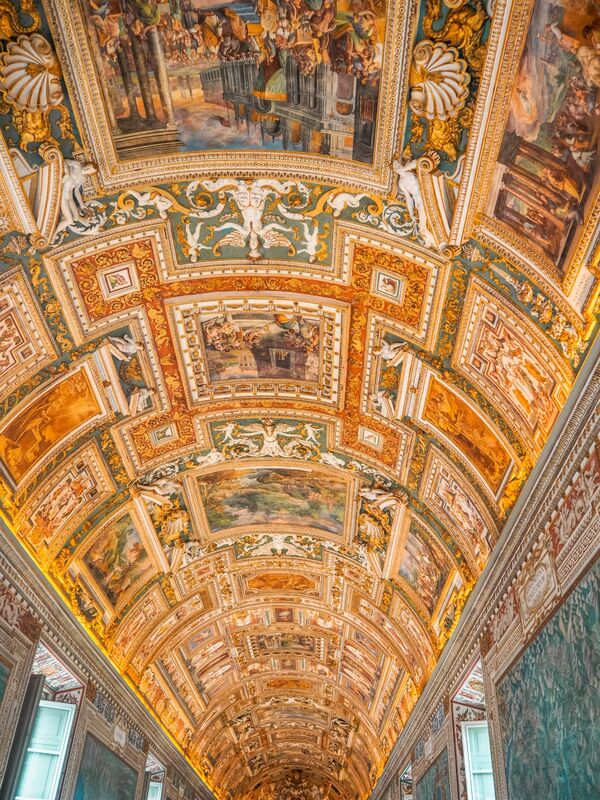 We planned to visit the Vatican Museums and Sistine Chapel when we first booked our trip, and we bought our tickets online 2 months in advance. These tickets get booked quite quickly, so I’d advise planning ahead if this is somewhere you plan on visiting. We were booked for an allotted time slot, and we were allowed to go and collect our tickets around 30 minutes beforehand, so also allow time for this. I did a lot of research before booking these tickets, to choose the best day of the week, as this can make a big difference. Saturdays are naturally the busiest day to go, and Sundays are closed – except for the last Sunday of every month, which would be one of the busiest times to go as it’s also free! 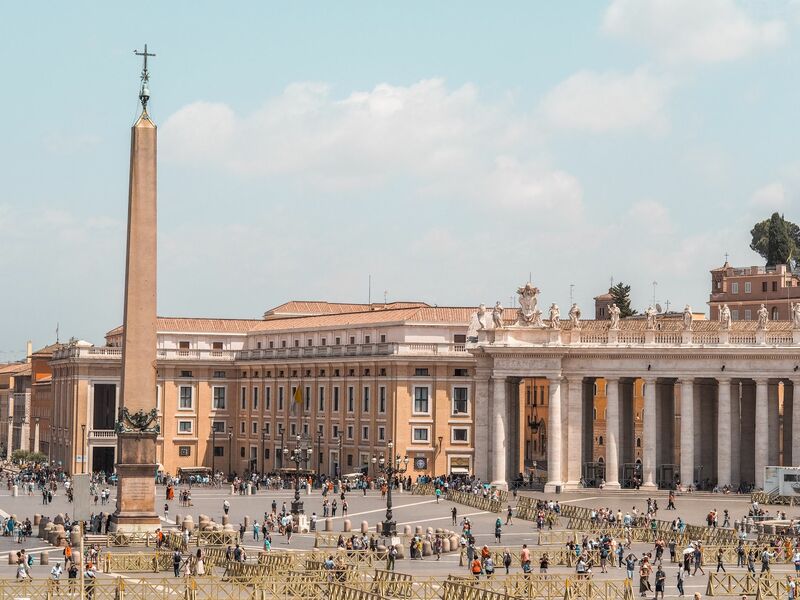 As a result, this often makes Mondays busy as well, and if the Pope is in Rome, the Papal Audience is held on a Wednesday in St. Peter’s Square, which makes this a really busy day to visit! The best days to visit would be: Tuesday, Thursday and Friday. 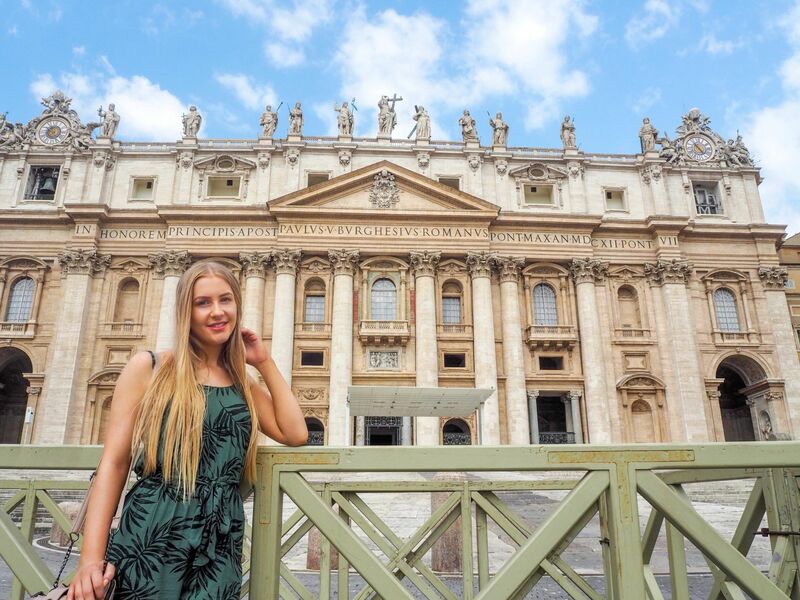 Even if you don’t want to go inside the Vatican Museums and Sistine Chapel, I would still recommend having a wander around St. Peter’s Square, especially as it’s free! 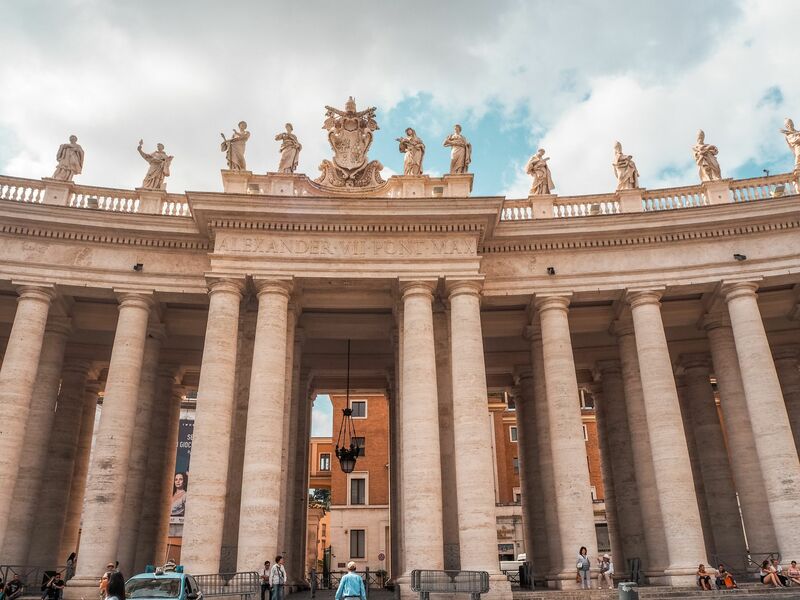 The Vatican City is a remarkable place full of history and culture, and it’s well worth a visit – just be prepared for the crowds. Top Tip: If you want to get photos at the Spanish Steps without too many people in the background, the best time of day to visit would be early morning (similar to the Trevi Fountain), around 7am. 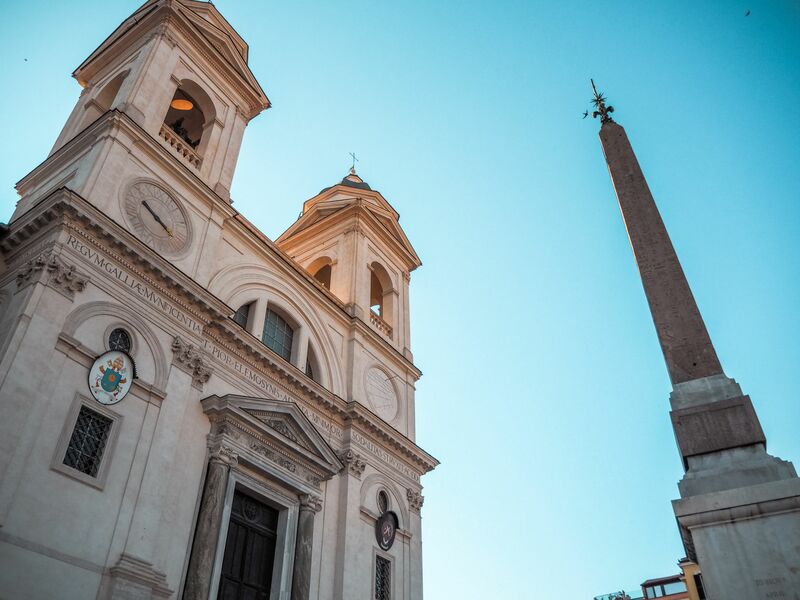 The Spanish Steps (138 to be precise) are a set of steps that lead from Piazza di Spagna at the bottom, to Trinita dei Monti at the top, where there is a stunning church that overlooks the steps below. The steps tend to get quite busy from around 8:30am, and remains busy throughout the day and evening. To be honest, other than the steps themselves that make for the perfect place to sit and people watch, there isn’t much else to do (unless you’re in the mood to spend lots of money in the many designer shops nearby). If you’re not that fussed about getting photos without too many people around, then a quick visit to the steps during the day would be enough, as there is so much else to see and do in Rome, you don’t need to spend much time there. 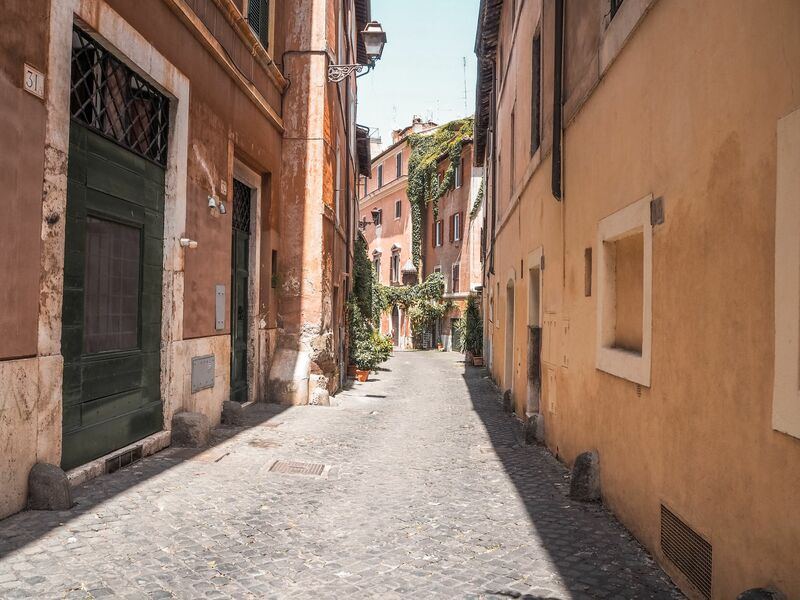 In fact, you may even find yourself coming across these steps unintentionally on your way around Rome, as a lot of people have stumbled across them without even realising! 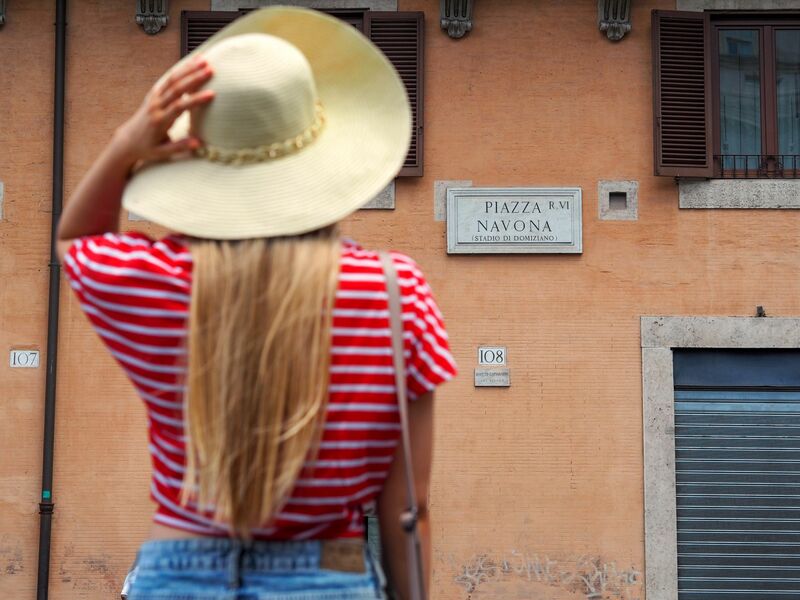 Top Tip: Although there are plenty of places to eat and drink in Piazza Navona, they are mainly catered for tourists, and you would be paying more than you need to. We didn’t stop to eat or drink here for this exact reason, as there are plenty of places nearby where you can buy the same thing at a much more reasonable price. Also, be aware of pickpockets in this area (as well as anywhere else you travel), as it can be quite a crowded place with lots of preoccupied tourists. 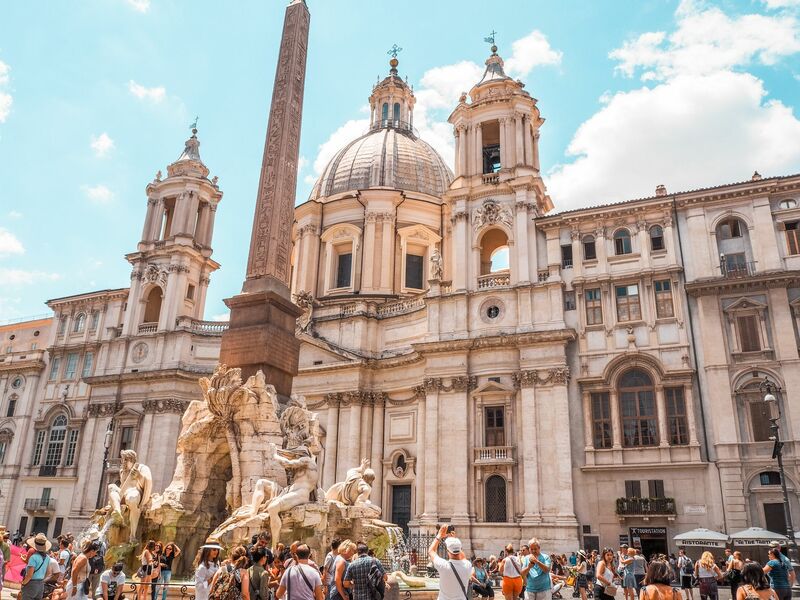 Piazza Navona is one of the largest and most stunning squares in Rome, with the Church of Sant’Agnese in Agone taking centre stage, along with 3 famous fountains: Fontana dei Quattro Fiumi, Fontana del Moro and Fontana di Nettuno. There are plenty of cafés and restaurants in Piazza Navona, where you can have something to eat or drink and take in the atmosphere. As it’s a public square, you don’t need to pay to visit and walk around, which is great if you want to keep the cost down as much as possible. You could spend as little or as much time here exploring the area, so you could plan a visit around how much time you have, allowing for total flexibility. Top Tip: Most of the restaurants are open in the evenings, so if you plan on visiting during the day, be aware that only a few cafés may be open. Trastevere is known for its nightlife and authentic Roman cuisine. Trastevere is a small but traditional neighbourhood just the other side of the Tiber River. It’s often a lot quieter than the centre of Rome, as it’s a lot less touristy, but it’s still a brilliant place to visit for its authentic Roman feel. As Trastevere is quite small, there isn’t an awful lot to see during the day (at least to spend a whole day there), but it definitely comes to life in the evenings! We had dinner at La Taverna de’ Mercanti, and it was absolutely incredible. The menu is on a scroll (which we were allowed to keep), and it was something so different to everything else we’d experienced in the centre of Rome. There was a small band playing traditional live music in the restaurant opposite, which was amazing to listen to whilst eating. The whole experience was brilliant, and I’d highly recommend visiting in the late afternoon / evening. 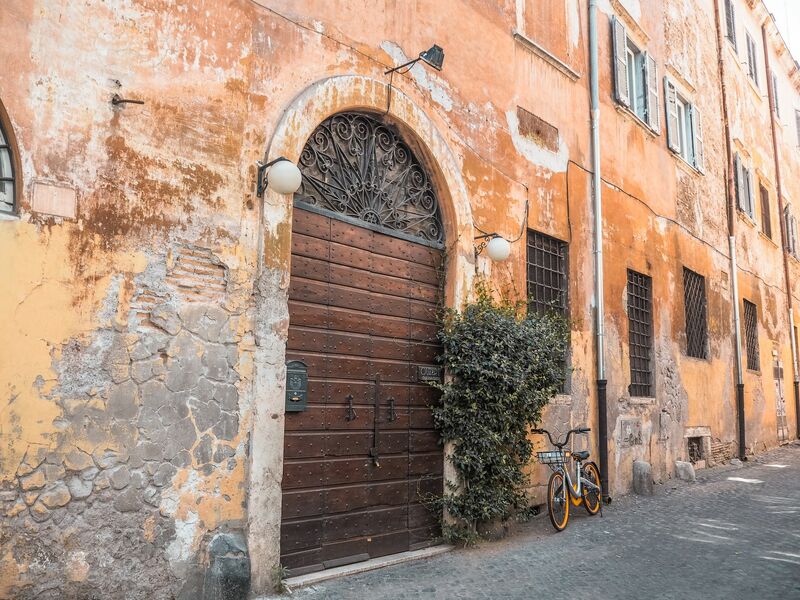 The architecture in Trastevere is simply beautiful, with its cobbled streets and colourful buildings – it’s definitely worth a trip exploring the other side of the Tiber River! We walked from our hotel in the centre of Rome, which took about 40 minutes, so if you’re wanting to save a bit of time, I’d recommend getting a taxi. This was the only time we took a taxi in Rome (heading back to a restaurant in the evening and back to the hotel after), but it was worth it just to take a break from walking and seeing Rome in a different way. Plan ahead! You don’t have to have a full hour-by-hour itinerary, but having some idea of what to do each day (with a backup option in case of any last-minute changes – like the weather) will help you save a lot of time and stress about fitting everything in. Book attraction tickets in advance if you want to beat the queues, especially for the Vatican Museums, but make sure you use the official websites – do your research! Don’t be afraid to get lost! Rome is one of the best cities to get lost in, as you will find something you’d never planned on visiting around every corner. It’s quite easy to walk between the ‘must-see’ attractions, and walking is the best way to take in the atmosphere at the same time. Comfy. Shoes. I cannot tell you enough how important it is to have comfy shoes to walk in, especially on those famous cobbled streets. I wore trainers most of the time as I knew we’d be doing a lot of walking, but the occasional (comfy) sandals are okay too. Embrace the culture and have fun. Travelling to a place you’ve never been to (or even returning to) can be overwhelming if there’s lots to see and do, but you can plan your trip around what suits you. You don’t have to go to every place on this list, especially if you’re short on time, but take it at your own pace, take lots of photos, and enjoy the wonders of the Eternal City. Have you ever been to Rome before? Did you do anything that I didn’t mention on this list, or that I would need to do if I were to go back? 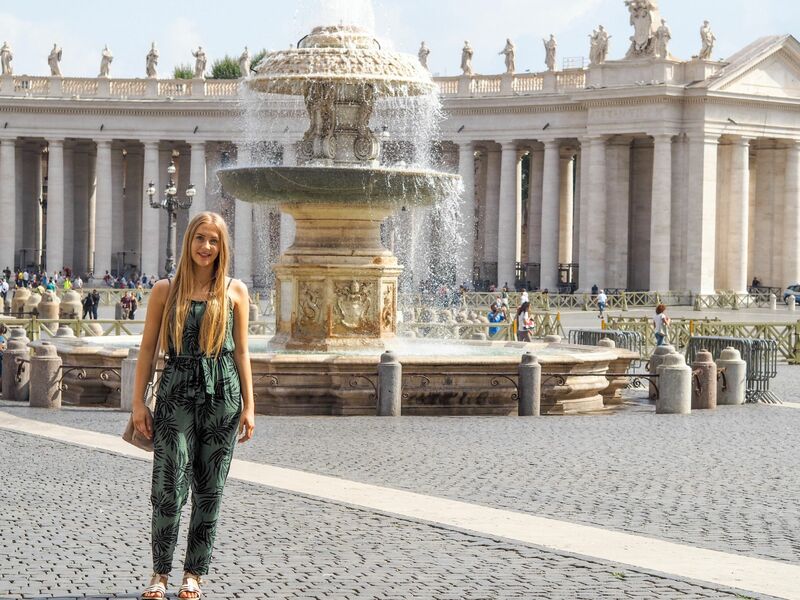 "7 Days in Rome: The Perfect Rome Itinerary"
"The Ideal Transitional Outfit for Autumn"
You look like you had the best time! I adore Rome, it’s been my favourite city break and we went back in 2012! I love it so much it has swayed me to plan my wedding in Italy.